Roaring Brook in New Russia after its restoration. Photo from Adirondack Council. 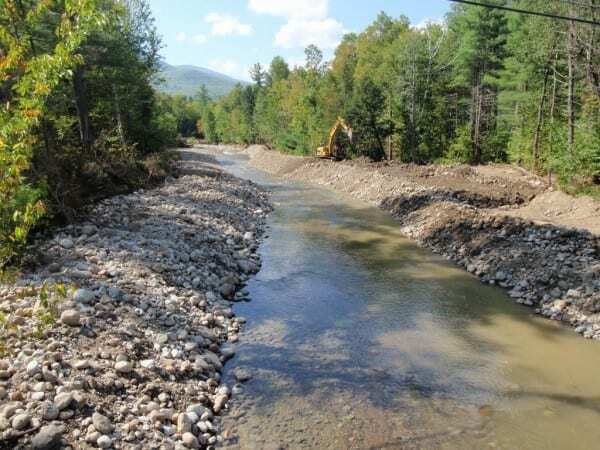 The Adirondack Council and Ausable River Association contend that highway crews intent on rechanneling streams after Tropical Storm Irene are destroying trout habitat and creating conditions that could worsen flooding in the future. Several mountain streams jumped their banks during Irene, flooding and damaging buildings and roadways. Since then, bulldozers have been used to divert the streams back into their original channels. 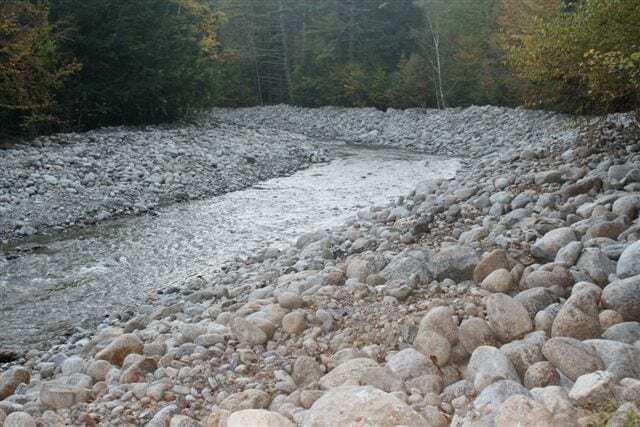 But Carol Treadwell, executive director of the Ausable River Association, said the bulldozers are also straightening the streams, removing boulders, lining the shores with rock, and smoothing streambeds. Treadwell said the altered streams are poor habitat for trout, which often hang out behind boulders, in riffles, and in deep pools near river bends. She added that trees will not grow back on rock-lined shores, thus depriving the fish of shade. Moreover, Treadwell said creating straight channels will allow water to flow faster, worsening the chance of flooding downsteam in future storms. Treadwell said the state Department of Environmental Conservation should require the crews to recreate natural conditions in the streams, with clusters of boulders, meanders, and varying depth. 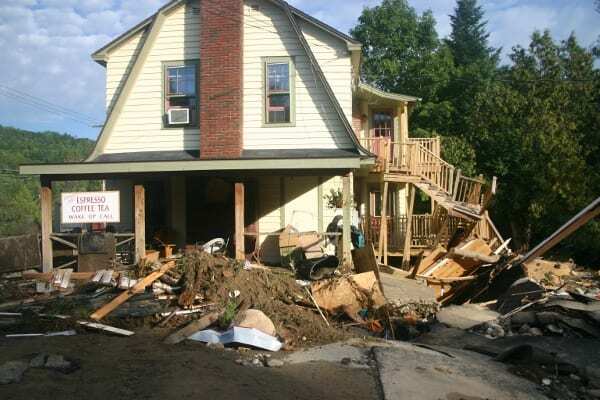 After Irene hit, Governor Andrew Cuomo issued an emergency order allowing crews to rebuild roads without acquiring the usual permits. 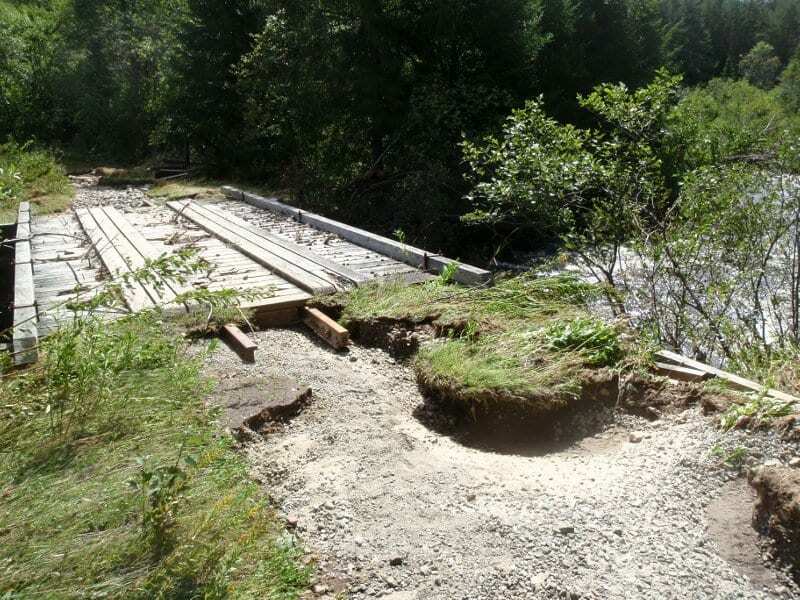 Bopp added that the department also has inspected the sections of streams that environmentalists have complained about. “DEC is currently reviewing the information gathered during the inspections,” he said in an e-mail. Some officials are urging that the East Branch of the Ausable—the river hardest hit by Irene—be dredged to minimize flooding the future. Again, the Ausable River Association contends this would only destroy trout habitat and worsen future flooding. Treadwell also said the river would need to be periodically dredged to maintain the channel. She and Sheehan said it would make more economic sense to help residents move out of the floodplain. Total and complete overkill shown in the first photo. What a shame. Some people should not be let loose with heavy equipment. That needs to be fixed. I urge folks to read the Council’s letter online. I think that it goes well beyond what they really can extrapolate from what we know at this time. Phil, this post is much more informative than others I have read. Is there really anything solid to back up these claims or are we all just guessing at this point? What is Ms. Treadwell’s background that she bases her claims on? Apparently she and the council have some information that these professionals do not? Paul, Carol is a scientist with a Ph.D., so she is more than qualified to talk on these matters. DEC has not contradicted her. They say they are looking into the complaints. Do bobsled runs help slow things down or speed them up?? Phil, Thanks for the info. That will ruffle some feathers down there. This is kind of a new area of work for the Council? Phil, do we have any “before” pictures? It would be interesting to see what Roaring Brook looked like on that section prior to the work. I think it would be great to see some before pictures as well to tell the real difference.